My blog will be incomplete without Idli and Dosa recipes. 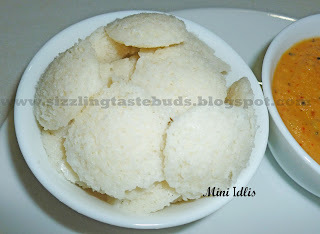 So here I am posting the most popular South Indian breakfast Idli. Nowadays, you get so many varieties of idli's in restaurants namely Rava Idli, Mini Idli, Vegetable Idli, Masala Idli, Malige Idli, Idli Fry and so on. 1. Soak Urad dal for atleast 3 hours. 3. Wash Idli rava and add urad dal paste to this. Mix well and allow it to ferment over night. 4. Add salt and mix well. Pour this batter into greased idli moulds and steam for 10 mins in idli cooker. 5. Serve these hot and spongy idli's with Sambar or chutney. 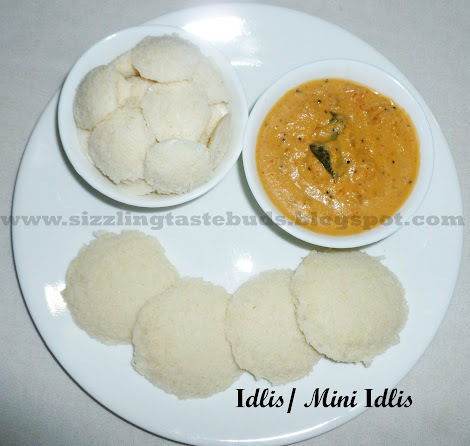 The above picture shows idli and mini idli's with Tomato Chutney. Mini Idli's and Idli fries are a big hit among kids. Its a perfect healthy dish that goes into my son's lunch box. To prepare this mini idli's, just pour the above idli batter into greased mini idli moulds and steam it for 10 mins, and kids will love to see those tiny, button idli's. Try these recipes and do let me know your valuable feedback. Also try Idli Fry with your left over idli's.